Ginny in Haiti: But...does it work? This is the most frequently asked question by donors and potential donors after they listen to how the programs Invest Hope offers works. Do they really repay their loans? Do they really contribute to their child's school fund? 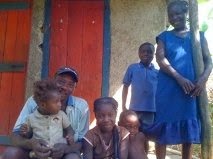 Does it really help Haitian families stay together? Yes! Yes they do! Yes they do! Yes it really does! Amicie finished repaying her first loan this past Sunday! Rosemirline finished paying off her 3rd loan this past Sunday! Family who was reunited with help from Invest Hope and remains together through help from our programs! One of the perks of our microloan program is that the funds are loaned out and then as they come back in, new loans are given out with the same funds that were originally given. In 3 years, 60 Haitians have participated in our microloan program. Out of those 60 people, only 2 have not repaid their loans. 96% of our loan participants have repayed or are currently successfully repaying their loans! You are directly helping families stay together! That being said, we are currently raising funds to build on our mission property in Peredo, Haiti! This land will house our mission office, which currently housed in a shoulder bag that I carry around! For the past 3 years, we have been setting up office under a tarp with a small table. As you can see, this is not the best set-up for a loan type program. Plans for the land include an office and a large gazebo to offer classes and waiting space. Haiti is very hot so the open sides of the gazebo will allow air to pass through while offering shelter from the sun. This gazebo will also be open for the public to reserve for meetings, weddings and funerals. This is just a taste of what we dream of doing for the people of Peredo on the mission property! To do this, we need the funds. This is the largest fundraising task I have ever taken on! But my Father in heaven owns the cattle on a thousand hills! Psalms 50:10. We are trusting in Him to provide! If you would like to help us in this project, please contact me at ginnyandrews@hotmail.com. We are looking for new partnerships with new churches and further partnerships with churches who currently support us.